America's most visited national park and a UNESCO World Heritage Site, Great Smoky Mountains National Park is both renowned for its diversity of plant and animal life and rich in remnants of Southern Appalachian mountain culture. 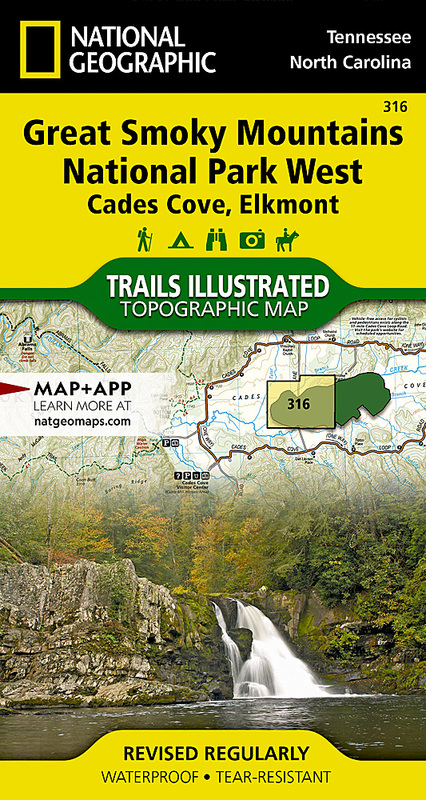 National Geographic's Trails Illustrated map of Cades Coves and Elkmont, covers the western part of the park, from Sugarlands Visitor Center area in the east to the western boundary of the park with Chilhowee Mountain and Lake. Created in partnership with the National Park Service and others for all kinds of outdoor enthusiasts seeking to explore the area, the map combines unparalleled detail of the region, essential area information and safety tips, including bear safety and valuable contact information. The map features many key points of interest as well, including Fontana Lake and Dam, Little Tennessee and Tuckasegee Rivers Cable Mill Historic Area and Abrams Creek. Other features found on this map include: Cherokee National Forest, Clingmans Dome, Fontana Lake, Great Smoky Mountains, Nantahala National Forest.